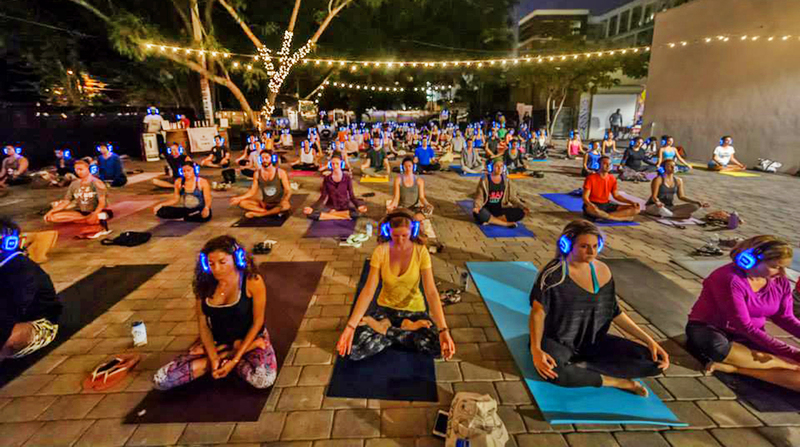 AMped and Gilt City Present Sound Off Yoga! Did you ever wish you could block out the noise of the world around you? Accessorize your yoga with sound proof headphones and merge the beauty of the city with the quiet of nature. Join Gilt City, AMped and Sound Off on Saturday September 19th for bending, balancing, brunching and rooftoping it up on the gorgeous Vertigo Sky Lounge. Bring your mat (the event is BYOM) and your hunger while you leave your stress at home! Your ticket gets you ALL these goodies! Noise-isolating headphones bring the DJ and teacher directly to you sans cab honks and construction clamor. Ticket sales end in 3 days so don’t wait. Get rid of your case of the Mondays by dreaming about this relaxing Saturday!